When I received those pictures, I was so happy to see how well it matches with the furniture of my sister's lounge. She is as well so happy with it! Dans les tons et magnifique....tout simplement ! Sheer perfection! This is the perfect quilt in this room...pulls everything together and makes it such a happy room! That is so lovely that she has given it pride of place in her lounge! It looks wonderful. A happy result! Wow! It is even more beautiful when treated as the fine work of art that it is. I can imagine how it fits in with all the other fine art in their home. What an honor! It couldn't be better! 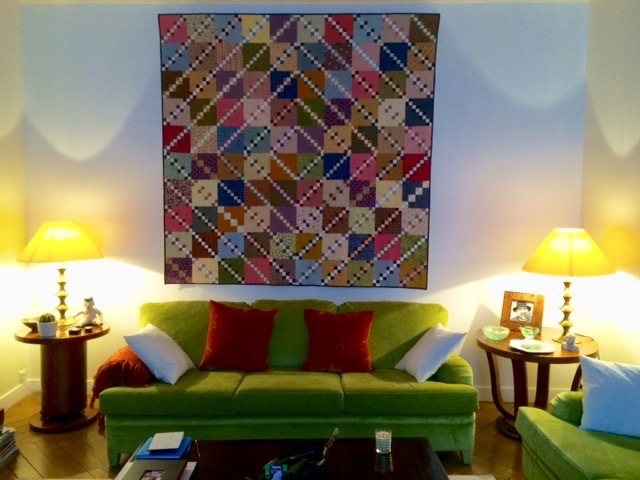 Thanks for sharing the gorgeous photos, the quilt looks perfectly at home. It looks STUNNING in this home - great project that's also on my to-do list. Superbe ! ce quilt est parfaitement à sa place dans ce joli salon coloré ! The quilt looks wonderful above the sofa, lovely shadows cast by the lights give a lovely romantic feel to the room. 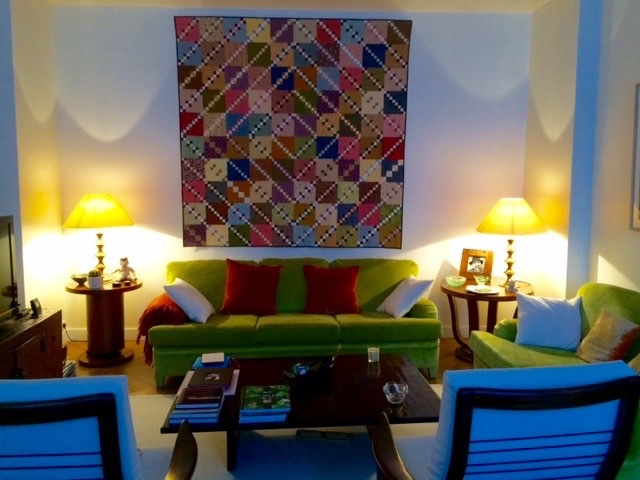 The quilt together with green sofa looks amazing! As I look at the colors of the squares in your quilt it shows how perfectly the quilt matches your sister's lovely lounge! Hi Christine! Wow that is a gorgeous quilt and so very perfect for the setting!